The VGS output steps from 4.0 to 10.0 V by 0.25 V, which is too fine until I get the Gnuplot script sorted out. The ID output runs from 0.0 A to 2.0 A in steps of 50 mA, which makes for smooth curves. These are all at 30 °C. 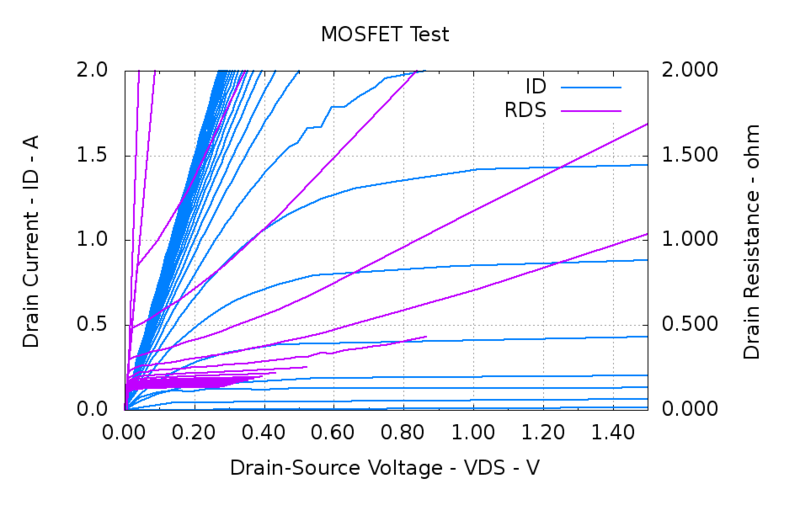 The drain resistance flattens out nicely for VGS beyond 7 V, which is well over the BUZ71A max threshold of 4.0 V. That means you really need more than the usual 5 V supply to control the thing; I’ll eventually try some “logic level” MOSFETs. 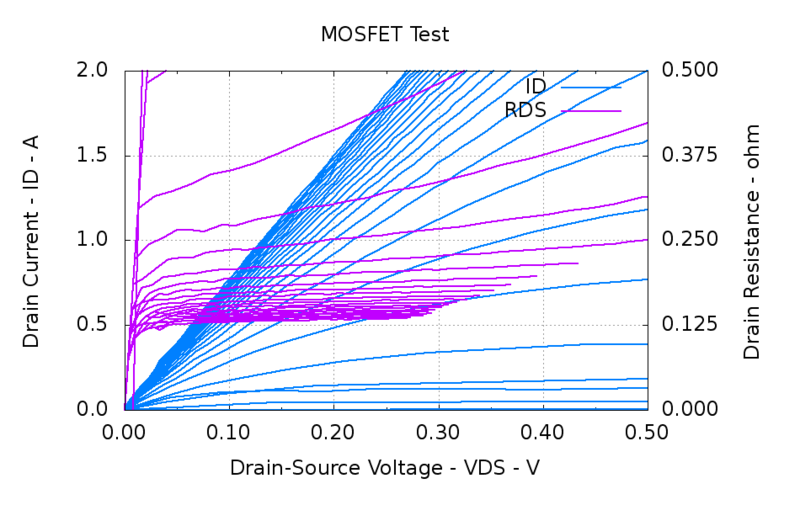 Part of the trick will be to find a logic-level MOSFET with a relatively high drain resistance suitable for current sensing. Two Arduino PWM outputs set the gate voltage and maximum drain current. The three jumpers near the middle allow various feedback paths, although the only one that really makes sense is closing the current loop. The trimpot is unused and the analog output directly sets the drain current limit at 0.5 A/V: 4 V → 2 A. 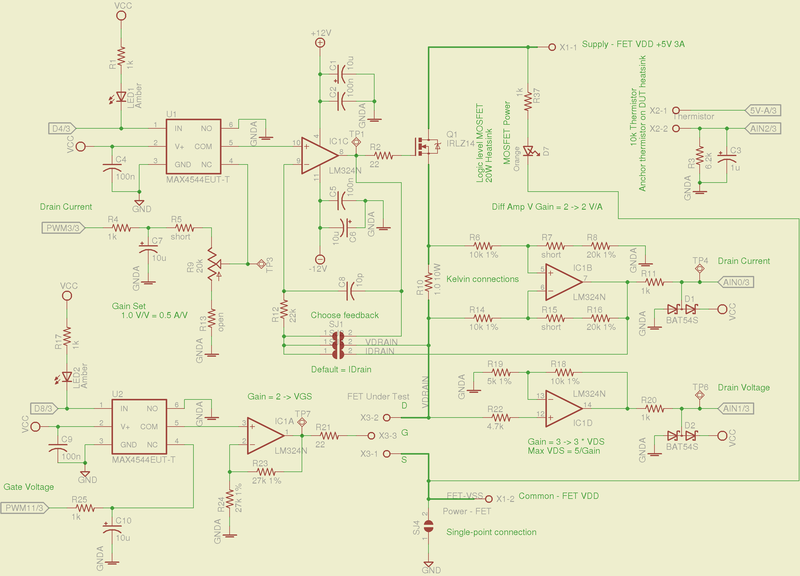 The PWM outputs must run at 32 kHz, not the Arduino-standard 500-ish Hz. The MAX4544 SPDT analog multiplexers switch between ground and the PWM voltages. That’s a simple way to turn the outputs off and on without waiting for the PWM values to ramp up and down. The LEDs on those control signals provide an indication that the firmware hasn’t fallen off the rails. Three Arduino analog inputs report the drain voltage, actual drain current, and temperature input. The LM324 op amps run from ±12 V, so a pair of BAT54S dual diodes clamp the analog inputs at one Schottky diode drop below ground and above 5 V. That should be close enough to prevent any damage without rounding off the values near the extremes, given the fairly high op-amp output resistors; the analog inputs present a reasonably high impedance and it seems to not matter much. The inner loop ends when the current limit, the actual current, or the drain voltage exceeds the corresponding maximum value. The outer loop ends when the gate voltage exceeds its limit. A 100 ms delay after changing any analog output allows time for the voltages to settle before taking the next set of inputs. Each pass of the loop updates the PI loop controlling the thermal block temperature. That’s certainly sub-optimal, but works well enough for my simple needs. 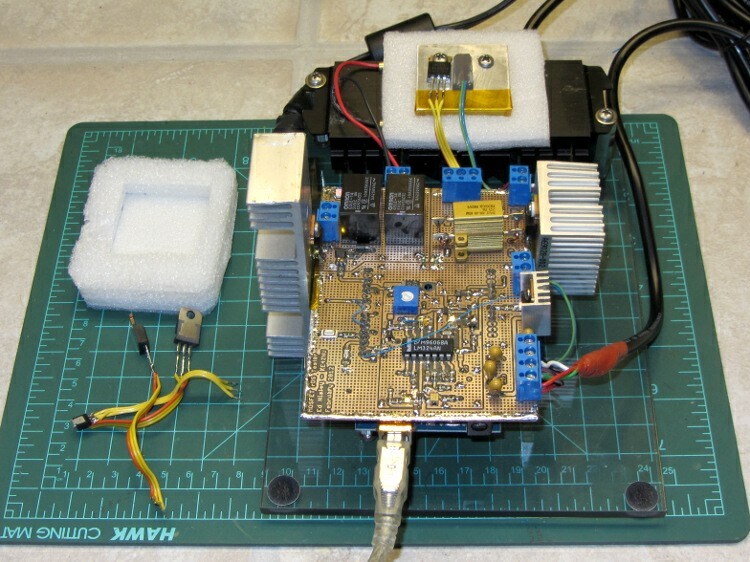 This entry was posted on 2012-03-15, 07:35 and is filed under Electronics Workbench, Software. You can follow any responses to this entry through RSS 2.0. Both comments and pings are currently closed.